The story of the self-made "Poker Princess" Molly Bloom, who ran high stakes poker games for rappers, Hollywood celebrities, and the business elite. We aren't ones to read gossip magazines (obsessively). We also have little interest in poker, so we really weren't all that familiar with the name Molly Bloom. That being said, we were still pretty excited to see "Molly's Game," a biopic written by Aaron Sorkin, who has penned brilliant screenplays for "Steve Jobs," "The Social Network," and "Moneyball." This time around, however, Sorkin didn't just write the screenplay, he stepped into the director's chair for the first time and directed this adaptation of Molly Bloom's biography "Molly's Game: From Hollywood's Elite to Wall Street's Billionaire Boys Club, My High-Stakes Adventure in the World of Underground Poker." The film stars Jessica Chastain as the titular Molly Bloom, the ambitious former competitive skier turned "poker princess," or so she was dubbed by the media. Joining her is Idris Elba, who plays her attorney Charlie Jaffey, as well as Kevin Costner, who plays her father Larry, whom Molly butted heads with throughout her life. The film follows Bloom's life from the end of her skiing career through her meteoric rise as head of her own poker empire that catered to celebrities and Wall Street billionaires, all the way to her eventual arrest and criminal hearing. We know exactly what to expect from an Aaron Sorkin-penned screenplay: fast-paced, punchy, rapid-fire dialogue, and we certainly get that in spades in "Molly's Game." There is no better actor to deliver Sorkin's words than the marvelous Jessica Chastain. The two-time Oscar-nominated actress could really justify getting a third nomination for her performance in this film. As Molly Bloom, Chastain is strong, powerful, and in command, but also has moments of deep emotion, vulnerability, and chaos. She hits each of these notes with precision-point accuracy, proving yet again she is one of the best actresses working in Hollywood at the moment. With Sorkin's dialogue and Chastain's delivery of the voiceover that runs throughout the movie, we become completely captivated by what is happening from beginning to end, even if we don't know all of the card game terminologies being expressed. Idris Elba does a wonderful job as Bloom's lawyer Charlie Jaffey. He approaches Molly in the same way the audience might. Those who know anything about Bloom got their facts from the tabloids, leading many to wonder why they should care about her or empathize with her. Molly convinces Charlie that she deserves a fair shake and shouldn't be judged, and at the same time, she convinces the audience to look past what they think they know and learn about the real Molly Bloom. 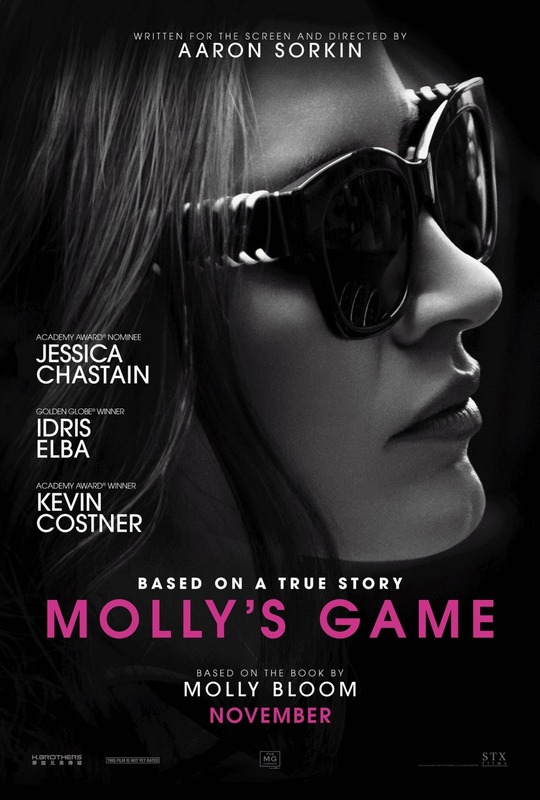 "Molly's Game" is a story that could be loaded with scandal and intrigue if the names of all the players involved were ever fully revealed. It plays it safe at times but still managed to pack some explosive moments and exchanges. The movie is long, but it doesn't feel that way due to its expert pacing and ultra-engaging story. Maybe it could have lost a few minutes here and there, but it does cover a lot of time and a lot of information, so it's hard to say if it could have been any shorter than it was. This may not be a perfect film, but we enjoyed the hell out of it and definitely recommend checking it out, especially if you are a fan of Sorkin or Chastain's past work.